Taking a page from the “Silver Linings Playbook”, the Community School tennis team got its “ju-ju” back during the State 3A tournament Friday and Saturday in Caldwell. Call it whatever—energy, good vibes, positive karma or old-fashioned determination—the Cutthroat “ju-ju” got the Sun Valley squad back in the game with its traditional 3A foes Parma and Fruitland. Well-balanced Parma dominated the two-day Idaho High School Activities Association tournament with 138 team points for the overall title and event champions in boys’ singles and mixed doubles—but coach Phil Huss’ Cutthroats were right in the mix. The Cutthroats with their 13 state qualifiers tied Fruitland (15 at state) for second-place overall with 76 points apiece. While Parma captured both boys’ and girls’ first-place trophies, the Community School placed second in the boys’ totals and third among the girls. Since 1997, Cutthroat teams have averaged 73.4 points at each state tennis tournament, but the total dipped to 29 points last year at state. 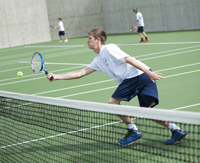 The 76 points last weekend at Vallivue High School were much more characteristic of the traditional Sun Valley strength on the tennis court. Huss said, “Great season all the way around, everyone got better and many are coming back next year.” His 13 entrants compiled a 21-13 record at state including 11-4 doubles. Leading the way at state was the new boys’ doubles champion team of Cutthroat juniors Trenor Gould and Roger Figge. They defeated teammates Doug DuFur and Dan DuFur 6-3, 6-4 in Saturday’s championship. It was the first Cutthroat state boys’ doubles title in eight years. In 30 years of competing at state, the Cutthroats own 22 state titles including nine in doubles. Placing third were district champion Olivia Ott in girls’ singles and the mixed doubles team of seniors Reed Roudabush and Jolie Blair. Roudabush and Blair proved to be incredibly dogged and resilient—winning five of their six matches including a 4-6, 7-5, 7-6 (4) victory for third place. “A phenomenal end to their tennis careers at the Community School,” said Huss about Roudabush and Blair. District boys’ singles champion Willis Sanchez-duPont captured fourth place at state, splitting a pair of matches with third-place Kooper Crow of Fruitland and pushing eventual winner Tanner Kramer of Parma to a first-set tiebreaker in the semi-finals. Final overall team totals (state qualifiers in parentheses): 1—Parma (16) 138 points (15th state title). 2 (tie)—Community School (13) and Fruitland (15) with 76 points apiece. 4—Weiser (3) 16. Boys’ team standings: 1—Parma 75 points (3rd state boys’ title). 2—Community School 53. 3—Fruitland 21.5. 4—Gooding 5.5. Girls’ team standings: 1—Parma 63 points (4th state girls’ title). 2—Fruitland 54.5. 3—Community School 23. 4—Weiser 12. 5—Gooding 7.5. Boys’ singles: Championship—Tanner Kramer (Parma sophomore) 6-4, 6-4 over Mitchell Nielsen (Parma sophomore). Third place—Kooper Crow (Fruitland sophomore) 7-6 (5), 6-1 over Willis Sanchez-duPont (Community School junior). Girls’ singles: Championship—Alysha Yasuda (Fruitland senior) 6-0, 6-0 over Madison Beck (Parma sophomore). Third place—Olivia Ott (Community School sophomore) 6-3, 6-2 over Emma Farmer (Fruitland junior). Boys’ doubles: Championship—Trenor Gould-Roger Figge (Community School juniors) 6-3, 6-4 over Doug DuFur-Dan DuFur (Community School senior, sophomore). Third place—Clay Nielsen-Parker Lewis (Parma senior, junior) 7-6 (3), 6-4 over Keagan Brixey-Cristian Gilbert (Parma juniors). Girls’ doubles: Championship—Abby Tesnohlidek-Brooke Teunissen (Fruitland senior, junior) 6-1, 6-0 over Deborah Blanscet-Lauren Smyser (Parma senior, junior). Third place—Katelyn Westover-Ashlyn Brush (Weiser sophomores) 6-4, 7-6 (4) over Raely Irish-Kailee Laub (Parma sophomore, junior). Mixed doubles: Championship—Trevor Nielsen-Makayla Stockett (Parma seniors) 6-0, 6-3 over Jacob Brown-Kaelynn Flaherty (Parma seniors). Third place—Reed Roudabush-Jolie Blair (Community School seniors) 4-6, 7-5, 7-6 over Jesse Cardenas-Morgan McCarthy (Gooding senior, junior).